Event Time: A tour of the Pool 9:15 – 9:40 a.m.
Press conference 9:40 – 10:00 a.m.
Elected Officials clean the Pool 10:00 a.m.
On Thursday, August 12th at 9:15 am, Austin City Council members and other elected officials will join volunteers from the Friends of Barton Springs Pool and city staff to clean algae and silt from Barton Springs Pool. The cleaning session will kick off at 9:15 a.m. with a short tour and press conference with a check presentation to the Friends of Barton Springs Pool to be used to fund a Barton Springs Pool Master Plan project. The elected officials will then be stepping down into the cold spring waters to work with volunteers to clean Barton Springs Pool. Officials who have confirmed their attendance include: Mayor Lee Leffingwell; Senator Kirk Watson, County Commissioner Karen Huber, State Rep. Donna Howard, and a few city council members. 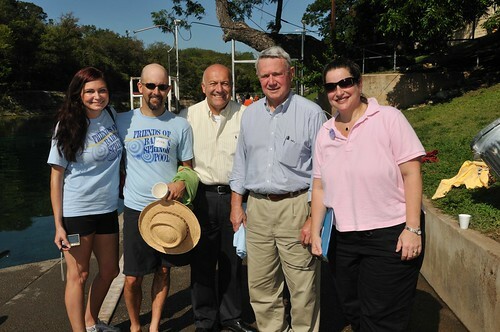 It will be the Fifth Annual Council Cleans the Pool Day put on by Friends of Barton Springs Pool (FBSP). The group formed in 2006, another drought year, to respond to the algae blooms that clogged the pool that year. Since then FBSP volunteers have worked side-by-side with pool lifeguards to help keep the pool clean. Inviting council members to the pool to see conditions first hand quickly became an annual tradition. The day will begin with a short tour of pool cleaning facilities and a look at problems with the bypass tunnel. Senator Kirk Watson will be the keynote speaker at the press conference to announce the funding. 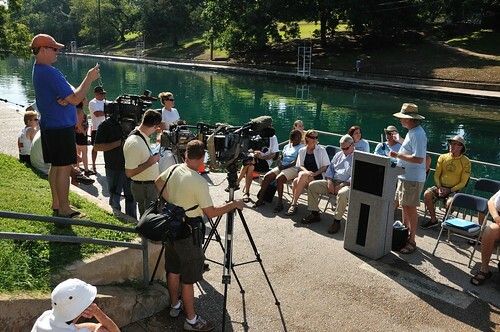 The press conference is often an opportunity for officials to comment on the progress of the Barton Springs Pool Master Plan, which envisions an array of improvements to the pool, grounds, and facilities. Talking done, the officials will begin their watery work. They will work in water up to their waists, pushing brooms and buffers to scrub the bottom, and dragging nets to skim the surface. They will also be tending to the plants that grow on the bottom of the Pool. 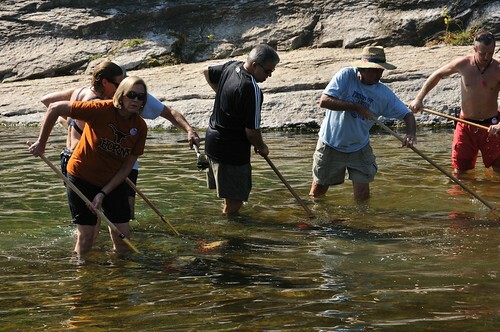 For more information, please visit our website at www.FriendsofBartonSpringsPool.org. Mayor Pro Tem Mike Martinez enjoying a swim in the Pool before the festivities began last year.